Yahoo Mail is an email service with a long tradition behind it. It was launched more than 20 years ago, in 1997, by Yahoo!, and has 3 plans (free, pro and business) and more than 200 million users, which makes it the third most popular email service in the world. A free Yahoo account will offer you 1000 GB (1 TB) of free storage, spam and virus protection, tools such as Calendar, Notepad, Contacts, Instant Messages, and Search, filters for incoming messages, an inactivity expiration date of 12 months (attention, once they have been deleted, accounts and their stored content cannot be retrieved) and a 25MB limit for attachments. It can be opened either on web, or through the free mobile application. 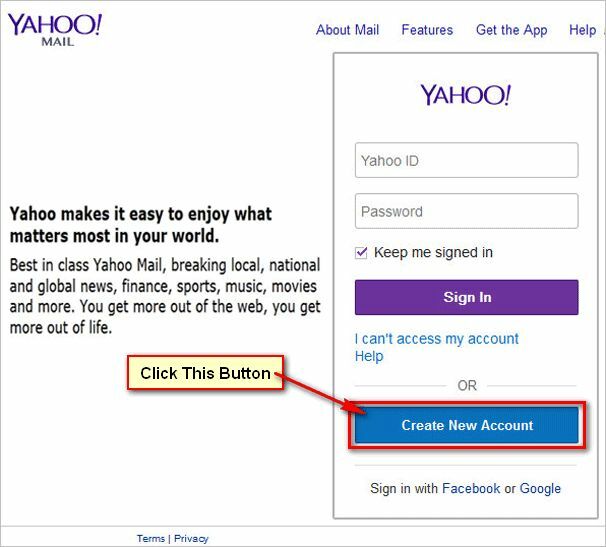 If you want to create a Yahoo account, these are the steps you need to follow. Open a new window in your computer/mobile phone browser, and go to one of these addresses: https://login.yahoo.com/ or https://mail.yahoo.com/ (this second link will redirect you to the login page). In the right side of the web page, will see a white area called “Sign in”. In the bottom side of this area you will find the text “Don’t have an account? Sign up”. Click on “sign up”. On the sign up page, complete the information requested in the corresponding fields. First, you need to write your first name and your surname (last name). Then, you can set your email address username. When you click on the “Email address” field, Yahoo will provide you with some available username suggestions. These will be formed from different combinations of the first name and surname you provided. You cannot choose a new domain for your email address. This will be set automatically according to the domain of the homepage (.com, .co.uk etc.). In the next field, you must set your password. Yahoo does not force you to use more than 1 type of characters (a combination of letters and numbers, for example), but it does test the strength of your password and requires you to set a stronger one, if the one you wrote is too easy to guess. If you want a password that you can remember easily, but is difficult to break, try a sequence of words. After you set your password, you need to enter a mobile number. This step is mandatory in order to create a Yahoo account and you cannot proceed without entering a valid number. You will use it in order to recover your account (in case you ever lose your password and forget the answer to the security question) further on. After you entered your mobile number, you need to write your birth date and gender (the last one is optional). After you completed all the requested fields in the form, read the Terms and Conditions and press on Continue. On the next page, you are informed that you will receive an Account Key, to verify that you are the owner of the phone number you provided. You can click on “Text me and Account Key”, which will prompt Yahoo to text a code to your mobile number. If you do not want/are able to receive a text message (SMS), click on “Call me with an Account Key”, and you’ll receive a call with the code. Write the 5-digit code received by call or SMS into the corresponding field (this will be in the middle of the screen), then click on “Verify”. Congratulations! 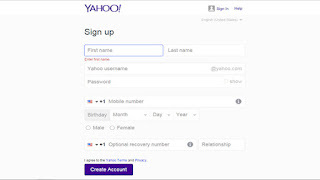 You have just created your Yahoo account, which you can now customize to your liking, by clicking on “Let’s get started”.